Coins that were found in the cave. The discovery was made in the framework of a comprehensive cave research and mapping project being carried out by Boaz Langford and Prof. Amos Frumkin of the Cave Research Unit in the Department of Geography at the Hebrew University, along with Dr. Boaz Zissu and Prof. Hanan Eshel of the Martin (Szusz) Department of Land of Israel Studies and Archaeology at Bar-Ilan University, and with the support of the Israel Nature and Parks Authority. The some 120 coins were discovered within a cave that has a "hidden wing," the slippery and dangerous approach to which is possible only via a narrow opening discovered many years ago by Dr. Gideon Mann, a physician who is one of the early cave explorers in modern Israel. The opening led to a small chamber which in turn opens into a hall that served as a hiding place for the Jewish fighters of Bar-Kokhba. 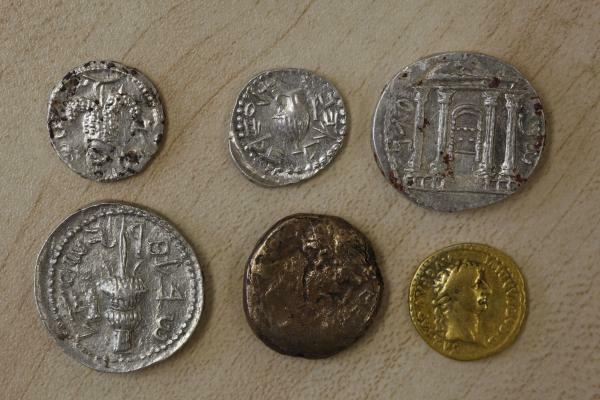 Most of the discovered coins are in excellent condition and were overstruck as rebels' coins on top of Roman coins. The new imprints show Jewish images and words (for example: the facade of the Temple in Jerusalem and the slogan "for the freedom of Jerusalem"). Other coins that were found, of gold, silver and bronze, are original Roman coins of the period minted elsewhere in the Roman Empire or in the Land of Israel. Bar-Kokhba coins of this quality and quantity have never before been discovered in one location by researchers in the Land of Israel, although over the years antiquities looters have found and sold large numbers of coins from this period. The high value of such coins has served as an incentive for thefts in recent decades, especially in the Judean hills, where many such caves exist. Prof. Frumkin points out the significance of this particular cave, owing to its size, its proximity to Betar, and the large collection of coins found there. Ancient Betar was the site of the "last stand" of the rebels led by Bar-Kokhba in their struggle against Roman rule in Judea from 132-35 CE. "This discovery verifies the assumption that the refugees of the revolt fled to caves in the center of a populated area in addition to the caves found in more isolated areas of the Judean Desert," said Prof. Frumkin. He also noted that the discovery adds significantly to our knowledge of the Bar-Kokhba revolt, about which there is not a great deal of historical information. Dr. Zissu points out that one of the fascinating aspects of the Bar-Kokhba revolt is the intensive use of the rebels and Jewish refugees of natural and man-made caves as hiding and refuge places in the face of extensive Roman search-and-destroy missions. Those who fled to the caves took with them food, weapons, drinks, coins and various documents. Sometimes they even took with them the keys to their houses that they abandoned in the hope that one day they would be able to return to them. Apparently, the people who left behind the cache of coins that has now been found did so during the period of the revolt, following their flight from their homes or from battle with the Romans; however they were unable to return to their hiding place to recover their valuables.